Students who are beginning studies in technology need a strong foundation in the basics before moving on to more advanced technology courses and certification programs. The Microsoft Technology Associate (MTA) is a new and innovative certification track designed to provide a pathway for future success in technology courses and careers. The MTA program curriculum helps instructors teach and validate fundamental technology concepts and provides students with a foundation for their careers as well as the confidence they need to succeed in advanced studies. Through the use of MOAC MTA titles you can help ensure your students future success in and out of the classroom. Server fundamentals such as managing Windows Servers (including virtualization) and storage, along with monitoring and troubleshooting servers are included. It also covers such topics as essential naming, directory, and print services. Students also learn of popular Windows Network Services and Applications. Lesson 1: Server Overview. Objective Domain Matrix. Key Terms. Understanding What a Server Does. Installing Windows Server 2008 RS. Skill Summary. Knowledge Assessment. Workplace Ready. 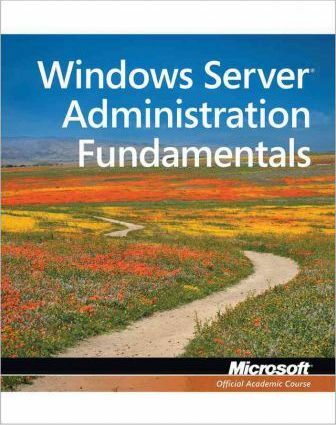 Lesson 2: Managing Windows Server 2008 R2. Objective Domain Matrix. Key Terms. Performing Initial Configuration Tasks. Using the Control Panel. Configuring IP Address Settings. Managing Devices and Device Drivers. Using Microsoft Management Console and Administrative Tools. Installing Programs, Roles, and Features. Managing Services. Understanding the Registry. Managing Server Core. Skill Summary. Knowledge Assessment. Workplace Ready. Lesson 3: Managing Storage. Objective Domain Matrix. Key Terms. Identifying Storage Technologies. Looking at Network Attached Storage and Storage Area Networks. Understanding Disk Structure. Using Disk Management Tools. Skill Summary. Knowledge Assessment. Workplace Ready. Lesson 4: Monitoring and Troubleshooting Servers. Objective Domain Matrix. Key Terms. Managing Information Technology. Introducing Troubleshooting Methodology. Booting the System. Understanding Performance. Introducing Business Continuity. Understanding Backups. Performing Server Repair. Skill Summary. Knowledge Assessment. Workplace Ready. Lesson 5: Essential Services. Objective Domain Matrix. Key Terms. Naming Resolution. DHCP Services. Introducing Directory Services with Active Directory. Skill Summary. Knowledge Assessment. Workplace Ready. Lesson 6: File and Print Services. Objective Domain Matrix. Key Terms. Introducing NTFS. Sharing Drives and Folders. Looking at Printers. Enabling Auditing. Skill Summary. Knowledge Assessment. Workplace Ready. Lesson 7: Popular Windows Network Services and Applications. Objective Domain Matrix. Key Terms. Introducing the Web Server. Understanding Remote Access. Introducing Remote Administration. Understanding Server Virtualization. Skill Summary. Knowledge Assessment. Workplace Ready. Appendix A. Appendix B. Index.